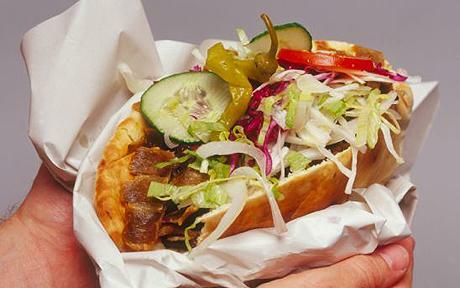 Forget about bratwurst, wurst and any other kinds of sausages -- döner kebaps (sometimes spelled with a final 'b') have overtaken all other traditional German fast food as that country’s favorite new on-the-go meal. Even such esteemed European leaders as Germany's very busy Chancellor Angela Merkel take time out to enjoy this legendary sandwich on a regular basis. But less you think that Germany is having all the culinary fun, just look towards the US state of Texas where big is better and now even the small has a chance for success. The Verts Kebap, a Berlin-style restaurant in Austin, Texas, is now offering these savory grilled meat snacks, first brought to Germany by Turkish immigrants during the 1970s. Each large sandwich features slow roasted meats wrapped in pita bread and topped with shredded lettuce, tomatoes, onions and a wide variety of dressings. As you might guess, döner kebaps are a great hit with both the penny-watching students from the University of Texas and the rushed legislators from the nearby state office buildings. But just when it seems that everything in Texas is about big-bigger-biggest, take a look at the unique food trucks this innovative restaurant is using. When not serving their tasty sandwiches, the restaurant's owners have been working with a team of German engineers to modify a small e-car into the world’s smallest a food truck. Unbelievably, each mini food truck contains refrigerator units, food warmers and sinks – all to code! But to be totally fair, it should be noticed that on arrival the staff sets up a tent, which gives them a little extra space (and some coverage from the mighty Texas sun). The mini food trucks are such a hit around the city that extra drivers are currently being hired. All in all it just might be that the new big is small no matter what ‘state’of mind one is in. 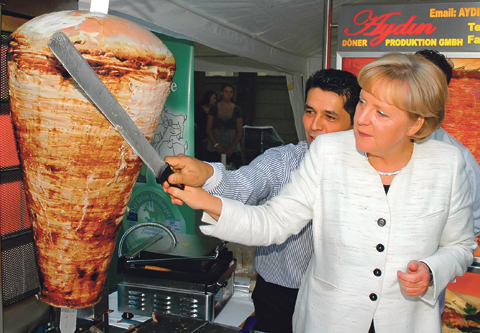 Posted on November 1, 2011 by Ana Kinkaid and filed under Cheese, Cleanliness, Cooking, Creativity, Cuisine, Design, Food Trucks, Restaurants, Sustainablity, Trends and tagged Angela Merkel Berlin Chancellor Doner Kebaps German Food Kepbabs Legislators Students Texas Turkish Immigrants University of Texas Verts Kebap.